Please arrive at Paddington station at 7:30am ( 08:15am on Saturday, 08:00am on Sunday) where you will meet our Golden Tours representative outside the National Rail ticket office in front of Platform 1. You’ll receive an informative welcome pack in exchange for your voucher. Your Welsh adventure will begin at London’s Paddington station at 7.30am. You will be greeted by our Golden Tours representative who will be waiting for you outside the National Rail ticket office in front of Platform 1. Providing you with your return rail tickets, you will then board the 8.15am train to Cardiff Central where your day of exploring can really kick off! Full of rich history, the Welsh capital is one that offers much to its visitors and you’ll have the time to discover it all at your own leisure. From exquisite architecture to historic landmarks, the world-renowned Cardiff Castle to the picturesque Cardiff Bay, you will be spoilt for choice at where to visit first! There’s no better way to explore a new city than with an open top bus tour taking you to the doorstep of the most famous locations and landmarks. Your ticket includes a fascinating open top bus tour through the heart of Cardiff that gives you the chance to soak in panoramic sights and learn of the city’s rich and vibrant history. 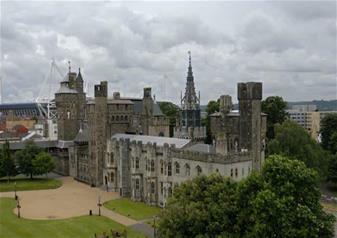 Take in views of Cardiff Castle, the old Cardiff docklands, Techniquest and the National Museum of Wales. Buses depart every 30 minutes so it’s an easy, convenient and enjoyable way to get to know this bustling capital! Whether you want to grab a bite to eat in one of Cardiff’s many eateries or hit the shops for some souvenirs to remember your trip, you’ll have enough time to do as you please before your return journey back to London. There are many gorgeous boutiques and seaside shops to enjoy! Your train departs at 5:55pm, arriving at London Paddington Station at 8:07pm.